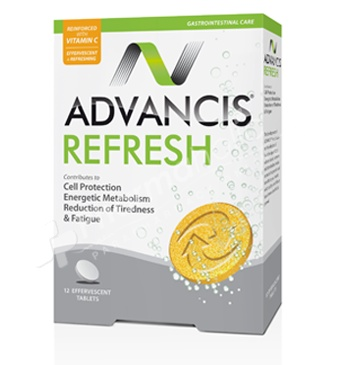 Advancis Refresh is a combination of antioxidants, vitamins and caffeine. Besides their protective, detoxifier and revitalizing role, these ingredients can help reduce the unpleasant sensation caused by alcoholic and tobacco intoxication or by excessive food intake. Advancis Refresh is a combination of antioxidants, vitamins and caffeine. Besides their protective, detoxifier and revitalizing role, these ingredients can help reduce the unpleasant sensation caused by alcoholic and tobacco intoxication or by excessive food intake. In addition, it restores energy levels, combats typical hangover fatigue, and relieves nausea. 1 tablet after waking, dissolved in a glass of water. In some cases, reinforce dosage with another tablet before lunch. Alternatively, as a hepatic protector, take 1 tablet before the intake of excessive alcohol or food. Take immediately after effervescence. Lactose; Polyvinylpyrrolidone; Acidity regulator: Sodium bicarbonate, Tartaric acid; Vitamin C (L-ascorbic acid) 13,6%; Anti-caking: Polyethylene glycol 6000; Silymarin (min. content 40%) 5,3%; Acidity regulator: Citric acid; Flavour; Anhydrous caffeine 1,5%; Flavour enhancer; Monosodium glutamate; Sweetener; Sodium saccharin; Vitamin B6 (Pyridoxine hydrochloride) 0,6%; Vitamin B2 (Sodium riboflavin 5'-phosphate) 0,15%. Do not exceed the recommended dosages. It is recommended to intake water. Not suitable for infants and young children and during pregnancy and breastfeeding. This product must not be used as a substitute of a varied diet.